As the 2016 summer season enters the final stages in the Northern Hemisphere, we coaches and athletes start to look at goal events for next season. After choosing events and putting them into the ATP, we can use WKO4 to identify each event’s unique physiological demands and build the right program to meet those demands. The place to start looking closer at the demands of an event should be race files from this year or a previous year. If you do not have a race file from the event, then you can use Best Bike Split to predict the demands. Set a goal Functional Thrshold Power (FTP) to achieve by the time of your event and use this when forming the race plan. First, consider the fatigue build up before this point. This section is the longest and steepest climb out of the three Col’s in the 2016 edition and is the last part of the 120km course. 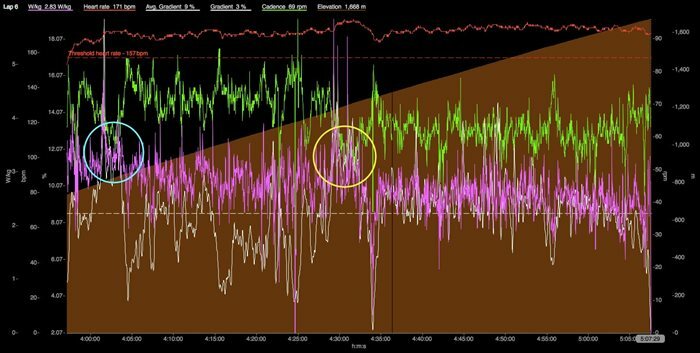 The hot temperatures in the mountains caused this athlete’s heart rate to exceed threshold for the last climb. Heat is a potential demand of this event, though cold and wet conditions are also a potential demand, given the unpredictable nature of the mountains. Based on this file review, we can build training strategies like these for dealing with the heat and altitude, and we can explore the demands of power further up the mountain with EC (Elevation Corrected) power. This will also help improve aerobic and power base for the total five hours of the event, as heart rate was lower on preceding climbs. On this particular climb, the rolling grade in the above chart shows the impact that the gradient had on cadence and power. This can be seen on the right in the blue circle, where gradient (in white, following the percent on the Y axis) averages 12 percent for 2 minutes and 30 seconds, while cadence drops to 58 rpm. 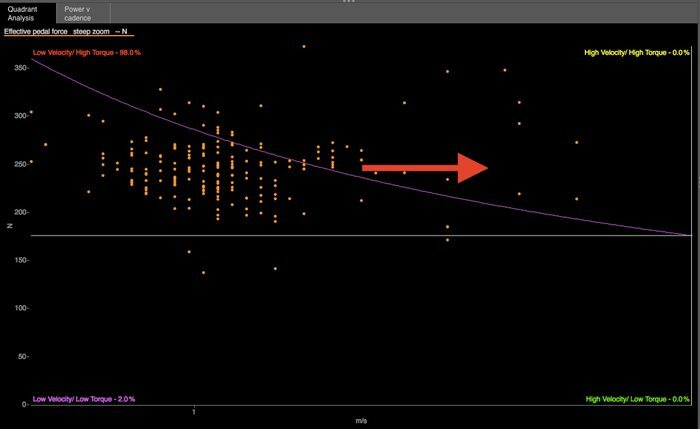 This time range can also be zoomed within the selected range above to bring up the average value for the new time range, to dig deeper and find further event demands. Cadence continues to roll up and down as gradient does the same. This then repeats in the yellow circle section, but with bigger variance in gradient, power, and cadence. Prescribe workouts based on the demands being placed on the athlete by the course. Identify improvements the athlete can make in the way he/she tackles the course and selects equipment. There are many considerations to make when planning the training for an event. When constructing a training plan, it’s important to look at as many event demands as possible and take those as your starting point, working backward from there. When considering the total duration and intensity, build up to the distance first by increasing your longest ride of the week. A good place to start is by increasing that longest workout by 30 minutes and maintaining the new distance over the course of one mesocycle or two to three weeks. Drop down significantly for a recovery week, and then increase by another 30 minutes, maintaining that new distance through the next mesocycle or two to three weeks. When you’ve built your longest ride up to the target distance, you can start incorporating intensity into it by adding climbs, Fartlek efforts, or intervals. 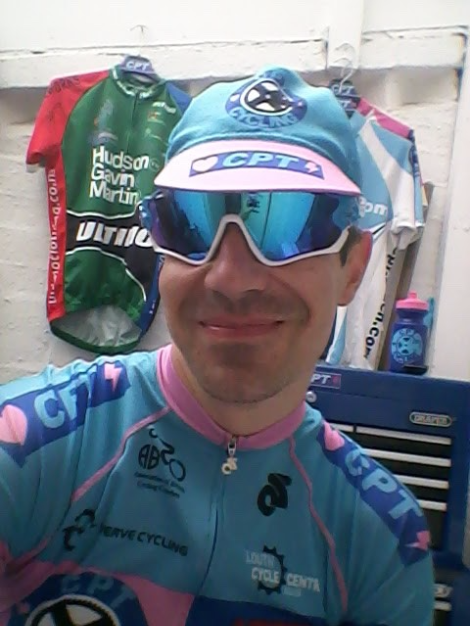 Going back to the climb referenced above, and bearing in mind that most riders training for a mountain event will not have regular access to long climbs, some specific workouts can be incorporated into a training plan to replicate the efforts needed for this event. The chart below shows the time in each power zone for the entire lapped climb. As the event draws closer, more workouts can be incorporated into the training plan with greater specificity. To help us with this, we can isolate the two steeper sections of the climb that were highlighted in the first chart with the blue and yellow circles. 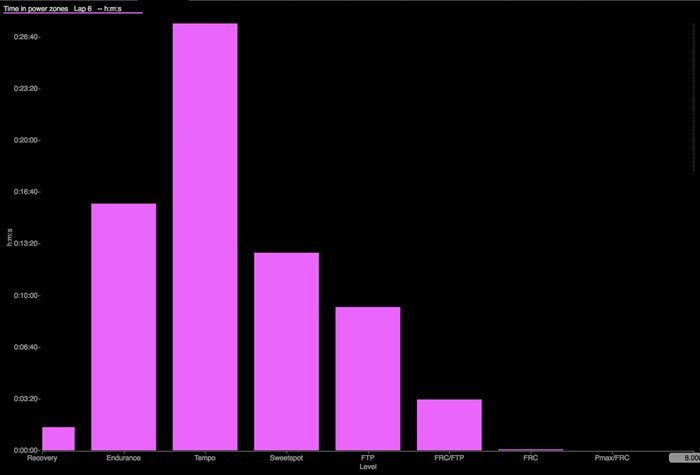 This shows an average gradient of 12 percent, with variance continually up and down from 10 to 15 percent. In this section, the Time in Zones chart allows us to see that there is some time in zone 3, but as with most steeper sections over 10 percent, the FRC/FTP zone is the main one being called upon. Using this section as an example, we can plan climb repeats on a short, local hill to replicate the demands of this section, choosing a hill as similar to this gradient profile as possible, aiming either to increase peak power on each lap or to increase total elevation gain for a given time period. Another workout goal could be to target the FRC/FTP power zone and increasing cadence targets each time, with the aim to improve the ability to produce power more efficiently, further toward higher velocity in quadrant analysis as shown in the chart below. 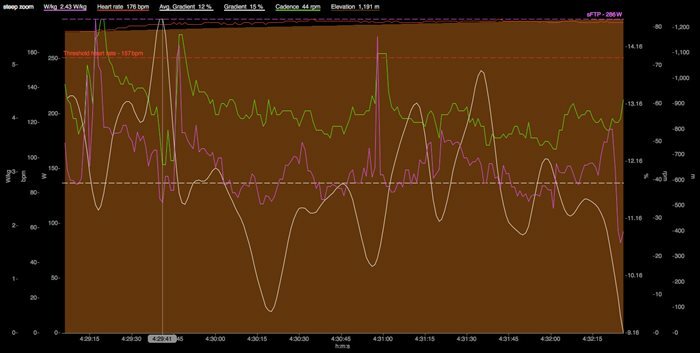 What works better and what doesn’t worked so well can then be tracked in WKO4 by using the default charts and creating your own custom charts to monitor power versus cadence, fatigue resistance metrics, and much more. Setting up your goals for next season means more than just getting them on your calendar. 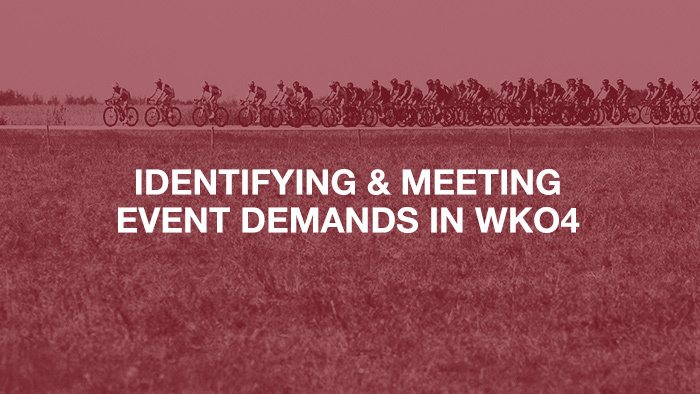 Use WKO4 to learn what the course will demand and create the right schedule to ensure that you will be ready on race day.